This product requires the base game Hegemony Rome: The Rise of Caesar. Fill the ranks of your army with professional foreign soldiers to demonstrate your superiority on the battlefield once and for all. 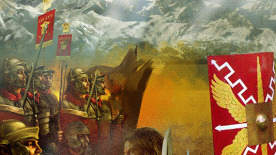 Make use of the newly added mercenary recruiting mechanic of Hegemony Rome: The Rise of Caesar. The Mercenaries DLC adds six all-new mercenary units from cultures around the Roman world to a city's ‘Mercenary Post’ building including the Garamante spearmen of North Africa, the raiding ships of the Suiones or Dacian swordsmen from the East. Hegemony Rome is required to play this DLC.